Merry Christmas everyone. Hopefully posting this many pictures makes up for not posting anything last week. Well, it's Christmas day, and the novelty of opening gifts and playing with toys all morning has already gone. It's funny, you look forward to it subconsciously all year, and consciously for at least a solid two weeks, and then it's over so fast. Now, everybody is taking an afternoon nap, then we'll have a quiet, relaxing evening, and then it's back to real life, like it or not. This Christmas was different for us because we didn't have any family around, it is just the four of us. And no offense to anybody, but it is quite a bit more relaxing, even though it isn't as exciting. Everything is going well. Jen and Jacy are both healthy and strong. All the ladies around are mad at Jen for how skinny she already is. Jacy didn't pass the hearing test in her lest ear at the hospital when she was born, so we had to take her to a clinic for a more thorough test. She passed that with flying colors and it's good to know that everything is just fine. Dax doesn't seem to mind her too much, at least he hasn't inflicted any serious injuries yet. He does seem a little too intrigued with her eyes, that could get dangerous. He wouldn't sit on Santa's lap for anything, but he sure loved the cupcake he got for going. Well, at least he loved the frosting off the top of the cupcake, cause that's about all he ate. They had one of our "larger" managers in the Santa suit, I'm scared of him too. Boy oh boy (or should I say "Girl oh girl"?) are we glad she didn't wait until Christmas eve to be born. Not only were we very ready for her to come, but she was ready too. She was born 8 lbs. 7.5 oz. (they rounded up to 8 on her birth certificate), so another couple of weeks and she might have been 10 lbs. plus! Jen started having contractions Friday night about midnight (so I guess I should say Sat morning [I'm using a lot of parentheses in this post]). She woke me up around 2 am, and we called our friends to come over to stay with Dax. When we got to the hospital around 3, she was having pretty strong contractions about every 3 - 5 minutes and was dilated to about a 5. The on call doctor was already there for another patient, so she came in to take a look, and we were very glad when she told us that Jen was progressing well and they were just going to keep us there. Then we were able to grab the anesthesiologist before he had to do a C-section, and got Jen's epidural all set up. After that we got about an hour and a half of sleep, before they came back to check her again. She was still progressing well, but they gave her pitocin to help speed things up. Didn't take much and Jen was having to really focus on not pushing so the baby would stay in until they were able to get the doctor there. When the doctor finally showed up, Jen only had to push for about 7 minutes, and Jacy was born at 08:35 EST. She was 19.5 inches tall, with a full head of dark hair. Jen's Mom flew in Saturday to stay with Dax, and has been a huge help. Both Jacy and Jen were doing so well, they let us leave the hospital on Sunday just after lunch. Now we are home and comfortable. Unfortunately, Jen isn't getting much more sleep, but that should improve. So, there's the story. Dax and I went to see one of the only 13 airworthy B-17s left in the world. You can pay six dollars to tour the plane, or four hundred to take a flight in it. 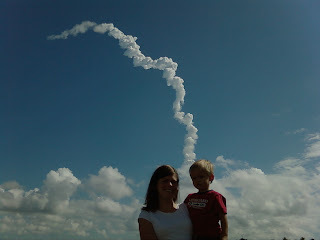 It is a beautiful plane, Dax really enjoyed it, we walked through it twice. You might notice the corner of a yellow sign next to him in the captain's chair. It said "Do Not Cross", but with Dax's face and smile, that kid gets whatever he wants. Is it weird that I took a picture of my son all happy and smiling next to some fake bombs that represent real one dropped during war to kill people? It made e remember Catch-22, good book. We had fun day together. It's nice to be working full time again and actually have two days off to do whatever I want. Here's a few pictures that I might not get around to posting if I only do one per post. Flying daddy's simulator. Flying the helicopter at the Children's Museum in SLC. The next Mozart. A little rain never hurt anybody. Of course, this was just a little rain. It really started coming down the other day as we high-tailed it home from a bike ride. I was already wet, so I tried to get Dax to come out and play, and he was a little scared of pouring sheets of rain, but he enjoys a little sprinkle. We aren't really sure why h calls the jam "pie", but it's probably just as well, because when we tell him it's called jam he says "dam". Of course there is no "n" at the end, but it still sounds the same. Then again we got out the video camera when he started saying "ah shut door" with more of an "i" than a "u". Too many quotation marks in this posting. Anyway, Dax sure loves his bread and jam, or, at least the jam anyway. Sorry it took so long to put a new posting up. We went to Utah last weekend, and I just got back from flying a brand new Cirrus from the factory in Duluth MN back here to FL, that was sweet. This is just to show how cute Dax is. The picture is the new outfit his Mom bought for him, that's right, she forgot a shirt. Pretty cute, too bad it doesn't cool off here for another 2 months. The video is a card my Mom sent that applauds when opened. He thought it was pretty funny, we thought he was pretty funny. I think he was saying "book" and "mail" amongst all his other ramblings. Let me start off by apologizing for not cropping my white body out of this picture. I can't believe how much better looking Dax is than me! This is from our trip to the beach with aunt Kristin. I don't know how many waves to the face a normal kid would take, but I submit this as evidence B that Dax is in fact a water baby. The day would have been perfect if I hadn't been stung by a Jellyfish on the way out of the water. Man was I glad I was carrying Dax, those things hurt. It felt like I had just walked into a hot grill, and it took a few weeks to fully heal. I'm also very glad Jen didn't get stung, she hates the ocean bad enough already, she would probably have never returned! I know he may not exactly show it like you'd expect, but this is probably his favorite ride at Disney World. Not the cool spinning spaceships with guns at Buzz Lightyear, or the flying ships of Peter Pan, but the Carousel. At least it usually has a really quick line. Here's another picture of Dax doing one of his favorite things, eating. I've been trying to teach him how to jump off of stuff and land on his feet. We go to a play gym in the mall by our house, and there are kids younger than him jumping off of everything, but he just doesn't get it. It's probably another unfortunate trait he inherited from his Dad, I'm not very good in the air either (the last time I tried a 360 on my skis I got a concussion). So, sometimes I pile up pillows and blankets and just let him land face first as he always does. I'm sure he'll get it some day, it's just his impatient father that pushes him too hard that makes it so tough. He walks around all the time saying "No Capes!" (a line from The Incredibles), but sometimes we disobey him and put one on anyway. Well, sometimes the sins of the parents are inherited by their children. I think Dax got one of mine. When that kid decides he likes a food, he'll eat it until he pukes (which has happened way too many times). Here is a picture of his Mom spoiling him with a treat (which also happens way too many times) I think it was cake batter. The video is of his incredible skill in eating corn right off the cob. I'm pretty sure he's way ahead of his age bracket in already having mastered that task. We went in for our ultrasound today. The baby seems to be healthy and normal, and even a little ahead of schedule. 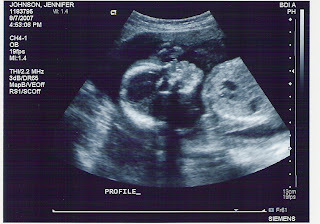 And the ultrasound technician said she was 90% sure that the baby is a girl, hooray. So, right after we had to go to Old Navy to buy some girl clothes. Man is Jen excited to buy big pink dresses and bows. So now we just have to figure out a name. Any suggestions? Here is the promised video of Dax playing in the little water fountains at "Donald's Boat" at Disney World. It was fun to watch, the kid really loves water. Next weekend I'll post the video we took of him at the beach with waves hitting him in the face. It's also really fun to watch him interact with the other little kids running around. Jen's sister Kristin was here for a visit, and we have had a lot of fun being way more active than we normally are. Everybody else needs to come visit and we'll take you all over too! Well, four years later, I'm finally going to start making back some of that enormous amount of money that I invested in flying. I earned my FAA flight instructor rating on July 3. Then, after an interview and a few tests, was offered a "Standz Class" (standardization class) slot. It was a long week and a half of all day in the class room and then studying all night for the test the next day. Six written tests and a hire flight later, I graduated and was officially offered an instructor position of July 31, hooray! Here is a picture of my fellow graduates from Standz. I'll be instructing in the international group because I'm small enough to fly the Cessna 152 (smaller than a lot of other instructors, and I thought I was getting big). The video is from when they were putting on my epaulets. Sorry it's sideways again, Jen keeps forgetting about that, hopefully it won't happen again, right Jen? This is a picture of Dax on one of our trips to Disney World. He loves to play in those little fountains that shoot up streams of water. Next week I'll post a video that we took of him today where we just let him go and get totally wet. Well, I guess when all you have around most of the day is your Mom, you pick up on some stuff that a proud father might want to keep under raps, too bad it's too funny to hide. I guess I should just come right out and reveal the truth, Dax has a whole bag of Jens old makeup stuff that he likes to play with while Jen is doing her makeup. Don't worry, I'll put a stop to it if he's still doing it by the time he's 19. I'm pretty sure this is the last video we have that is sideways, so sorry about the kinked neck you're sure to suffer, but it should be the last one you can blame on us. This video was taken one evening that we were watching our friends kid Brayden. These two always imitate each other. I was really sad I couldn't record them at church one week when they both found a pair of sunglasses and were dancing to the intermediate hymn. I don't know about you, but I think Dax one, and he didn't even have to pull off his diaper. (That's aluding to Zoolander if you haven't seen it.) The picture is of Dax helping me wash our car, well, trying to help, mostly just eating the "bubblesh". In news: two years after my commercial license, I've finally gotten my Certified Flight Instructor Rating, whew! So I am now in Delta Connection Academy's "Standz" Class that trains all new hire instructors, and contingent on satisfacory completion of the class, I'll finally start making money flying, yea! This was one of Dax's short lived dance moves, probably a good thing. One of the songs that came over the PA system at Disney World really got him going and he fell over flat on the asphalt, it was pretty dang funny. That's why I play the devil's advocate in this video, I wanted to re-enact that event. Anyway, Dax had a great time in Utah hanging out with family, as did both Jen and I. We think it really was good for him to be around his cousins so much, he actually played in Nursery today, hopefully he will continue to become more social and more tuff! We thank everybody that took time out of their busy everyday lives to help make our stay more comfortable and fun. Thanks. Here's a pic of Dax in a flotation swimsuit, it didn't work as well as his floaties, I think he just didn't like it as much because he didn't get as much of a tan. I interrupt my normal weekend posting for this important announcement: Dax is certifiably a water-baby. We've tried a few things to help him stay afloat, but he took to the arm floaties better than anything. I can now officially throw him in the water and know that he'll be OK. Of course that's not what I do every time, I don't have to, he runs to go down the steps faster than I can get the gate closed behind us. But sometimes he still needs encouragement, as you'll see in the video. Nothing really new or exciting going on around here. We were a little bummed that NASA decided to land the space shuttle in CA, because we hear that the two sonic booms it makes as it re-enters the atmosphere sound like shotgun blasts in your living room. Maybe we'll get that pleasant treat next time. This video is of Dax when he figured out how to fake laugh, he only really did it that one day, I haven't seen him do it since, maye he saw this video and realized how ugly he looks when he does it. The picture, where he is again looking very attractive, is climbing a fence at the Epcot Center. In contrast to last weeks posting, I figured I would show what Dax is like on the way to Disney World. Don't get too excited by the video appearing to be upright, it doesn't last, but don't worry, Jen now knows not to hold the camera that way. And just in case you are curious, the song in the background is: "Brand New Key" by Melanie, great little tune, you can tell that Dax likes it. The picture is of us on the Carousel at the Magic Kingdom. See what I mean, computers are as much of a pain as a help. Obviously I will have to start proof reading my posts. I meant to say "the video is very loud", and apparently this laptop requires a very deliberate push on the space bar to get it to work. You know, computers and technology end up takingas much time as they claim to help save. I spent a few hours tryingtofigure out how to rotate an AVI video file. I surfed the web. I downloaded software and followed instructions. Nothing.So, I'm sorry if you get a kink in your neck trying to watch this video, but I hope it is worth it. The video isn't actually all that great, it's pretty load because we are in the car, and kind of boring, but that is the point. Dax is usually all about showing off for the camera, but he justcan't find the energy after a day at Disney World. After viewing the video, take a look at the picture, it was taken about 30 seconds after Jen stopped filming, poor tike. Sorry it has been so lang since I last posted anything, but this video should make it all worth it. It's Dax jsut rockin' out in his stroller, listening to an MP3 player. This video made us realize that it's even funnier to watch him dance when only he can hear the music. I think he likes it a lot more than having to listen to only one side of the conversation between his Mom and Grandma that always takes place during his walks. If we aren't having twins, guess I'll by a cheaper second mode of transportation. Really, why not get a bike. Florida has 12 months of good biking weather, a newer model costs half as much as a crappy car, and 80 miles to the gallon, need I say more. Ya, of course there are some cons too. I had to take the car this morning because it's a little tuff carrying golf clubs on a bike. But other than that, it all seems good to me. Don't worry, I bought a helmet even before I bought the bike. And I only really use it to go the 3 miles between our house and the airport (and to run small errands on a nice evening). Plus, if you've seen Top Gun, how can I be a pilot and NOT have a bike? It's funny too, it just automatically adopts you into the cycling community. I had never noticed it before, but ALL other bikers wave (stick out their hand like a boyscout turn signal) as they pass on the other side of the street. I've got a guy just down the street that wants me to go "riding" on the weekends, people are funny. And yes, I feel pretty cool on the bike. It's a little 250cc Honda Rebel. It's a 2003 with 6300 miles on it and in great shape. And just so you don't feel that you've wasted all this time reading this boring info, here's a picture of Dax too, for good measure.